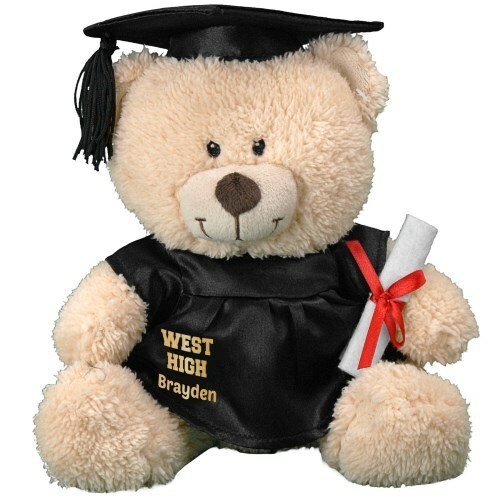 Celebrate your new grad with this plush graduation keepsake teddy bear. This plush teddy bear creates a truly special gift any new grad will love to receive. This removable graduation cap and gown design is featured on our Sherman Teddy Bear. Sherman has an irresistible look on his face along with a wonderfully soft feel. He features contrasting tan fur on the inside of his ears and his snout and measures about 11” tall. Free personalization of any three line message is included. Free gift wrapping and a free gift message are included to help create a thoughtful presentation. A great high school or college graduation gift to help celebrate their accomplishments! Additional Details Honor your favorite graduate with one of our other great graduation bears!